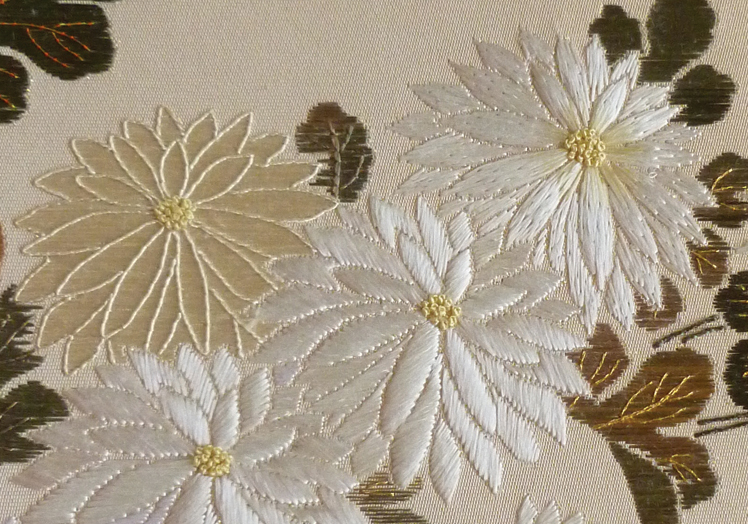 What makes Japanese embroidery so different from European? Using this stitched screen (1), one of a seasonal set of four, will help to explain some of the basics. First glance might suggest subject, as most stitched designs follow the seasons with traditional motifs and colourways and Japanese design tends towards a spare and minimal layout. The second thing you’ll notice is probably materials, starting with the silk floss used to embroider on to silk fabric. Twelve to sixteen individual strands of silk filament (suga) come wound on to tubes in ‘threads’ (2). 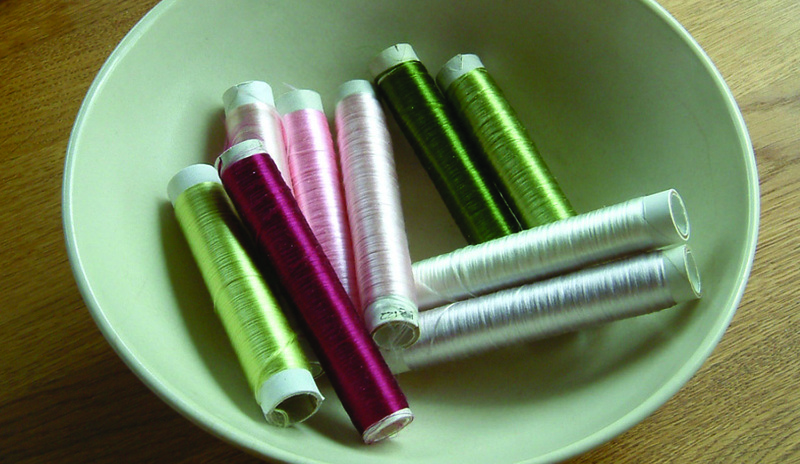 For convenience this is called a thread, but the basic unit is used in fractions and multiples to form the desired thickness of working thread. It can be used flat or twisted depending on the effect wanted and the variables are infinite. Flat (ie untwisted) silk is usually used in multiples of one to two threads in the needle at a time, giving surfaces a very rich sheen. This is the most obviously different thread as westerners have been used to twisted skeins for a long time. When used absolutely flat, areas of colour are laid for less important background elements, or as an actual background which will later be stitched on. When stitched over a layer (or several) of cotton padding, gently three dimensional shapes are formed. Halves or quarters of the silk thread can be combined in the needle at the same time to achieve subtle colour toning, but motifs tend to be stitched in very few colours, relying on stitch direction to catch the light and suggest shape and dimension. Where European embroidery might use a whole palette on a petal, it’s not unusual for Japanese techniques to use two or three at the most on the whole bloom. 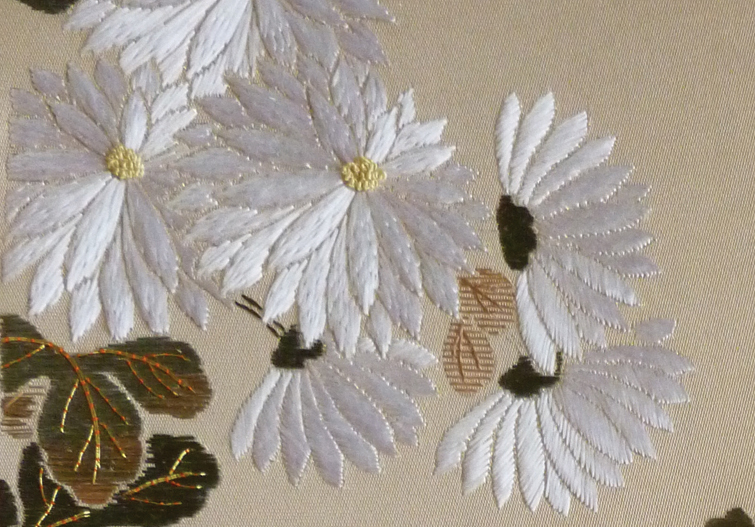 The chrysanthemums in the photo have been stitched using white (3), ivory (4 and 5) and buttermilk threads, but only one colour on each flower head with yellow accents in the centre knots. Colour and form are suggested by judicial padding and stitch direction. These techniques were developed to be worn and you really need some movement - yours or the embroidery’s - to see them at their best. Starting with flat silk threads and twisting them together takes a bit of practice and gives a stronger ‘taste’ and more dimension. It’s most often used for foreground elements or stronger, larger motifs (5), though when twisted in fractions of a thread you can achieve very elegant suggested shapes. 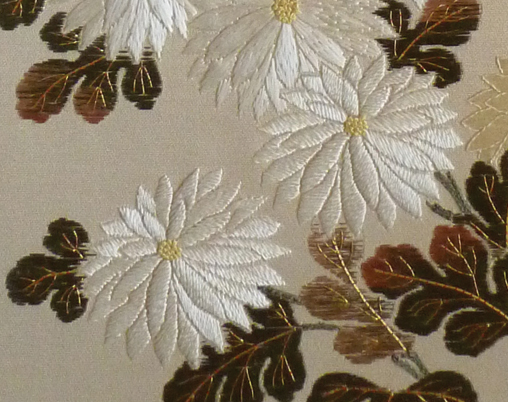 Look at some of the background leaves on the piece: thin twisted threads in pale colour using very few stitches. 3)Flat white silk. This also shows leaves stitched very lightly in the background and full-on colour for the foreground shapes.